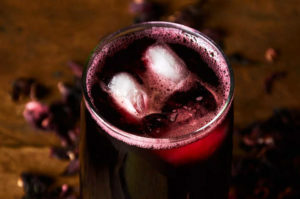 Agua de Jamaica which translates as “hibiscus water” is a typical agua fresca to accompany the mid-day meal in Mexico. It is sweet, tart, delicious and really refreshing all at the same time. 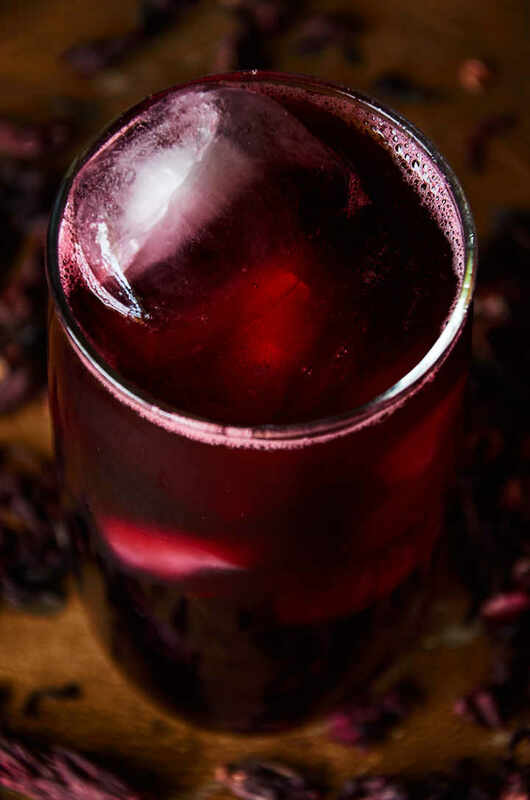 You prepare it by steeping hibiscus flowers, called flor de jamaica to produce a concentrate which you dilute with water and sweeten with sugar. Jamaica is a great alternative to soda. 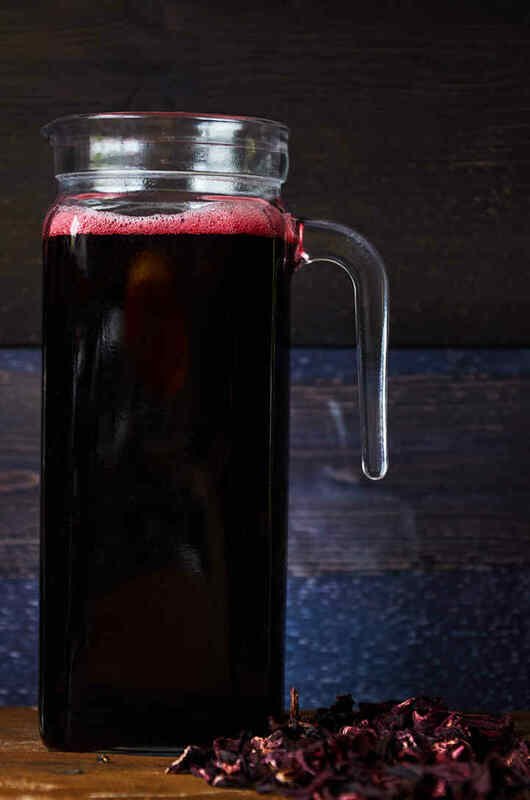 Mexicans tend to prefer their agua de jamaica very sweet. If you add the full 1/2 cup of sugar called for in the recipe to make a pitcher of jamaica it will be sweet like served in Mexico. We prefer it on the tart side. If you prefer it on the tart side only add 1/4 of sugar per picture. It’s really quite simple to prepare. Follow these steps. 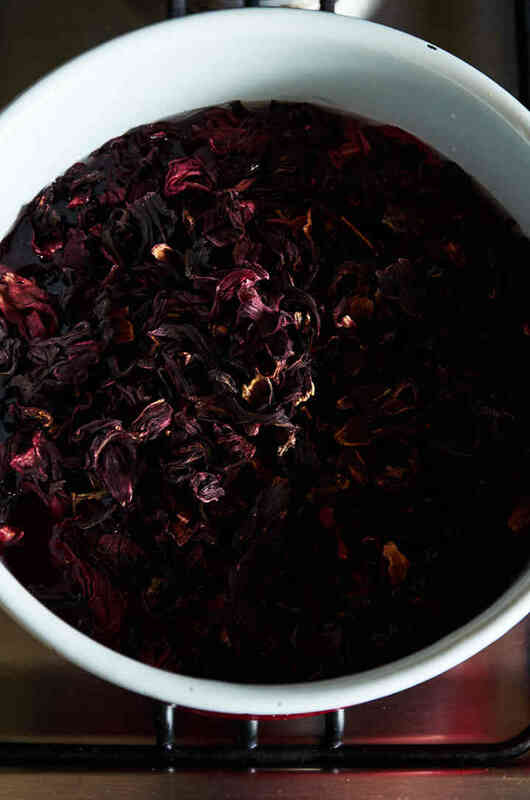 Start with two cups of hibiscus flowers (jamaica). Fresh flowers produce the best tasting drink. If the flowers are pliable they are fresh. If they are hard and brittle they aren’t fresh and your jamaica won’t be as tasty. 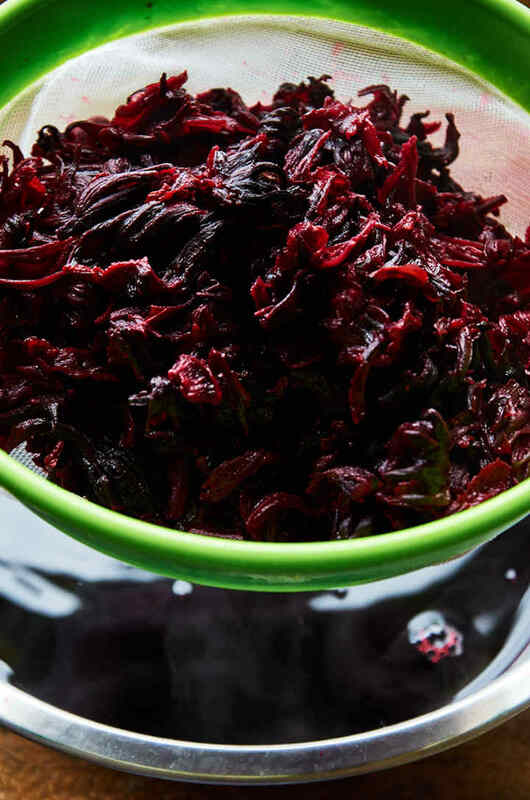 Add the hibiscus flowers to two quarts of cold water. Add the hibiscus flowers to 2 quarts of water. Be sure you add the flowers to cold water. This makes a difference. 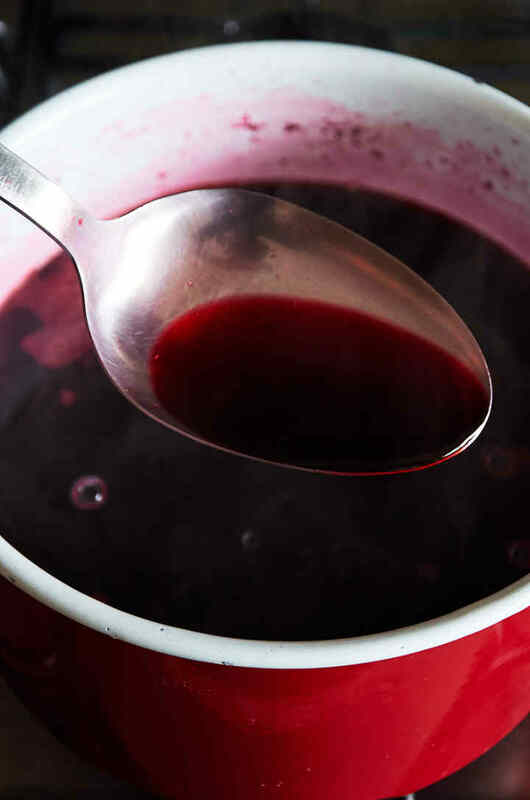 Bring the water to a boil and as soon as it boils reduce the heat to low and simmer for 10 minutes. After 10 minutes turn off the heat and allow the concentrate to cool. Fully extracted hibiscus concentrate. Note the deep red color. As the flowers steep they absorb water and will sink to the bottom of the pot. That’s how you will know that the concentrate is ready to use. Pour the concentrate through a strainer to remove the flowers. Pour concentrate in a small pitcher or jar to store. Pour the concentrate into a small pitcher or jar to store. 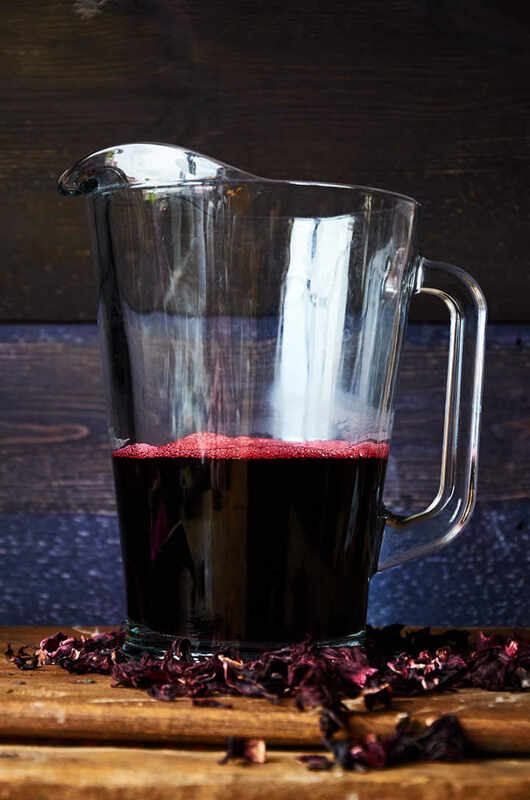 You started the process with 2 quarts of water but after steeping the hibiscus you will only have 1 1/2 quarts of concentrate. The flowers absorb quite a bit of water. A glass pitcher or jar is preferable for storage. Plastic containers seem to give it an off taste. Also, the concentrate tends to stain plastic. 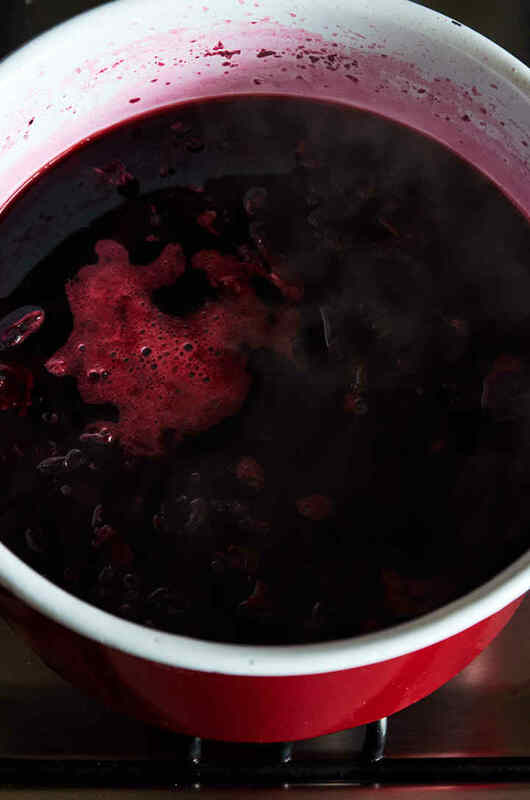 To prepare the drink, pour 1/3 of the concentrate into a 1/2 gallon pitcher. Add the sugar and water to fill the pitcher. Stir vigorously to dissolve the sugar. Serve over ice or well chilled. 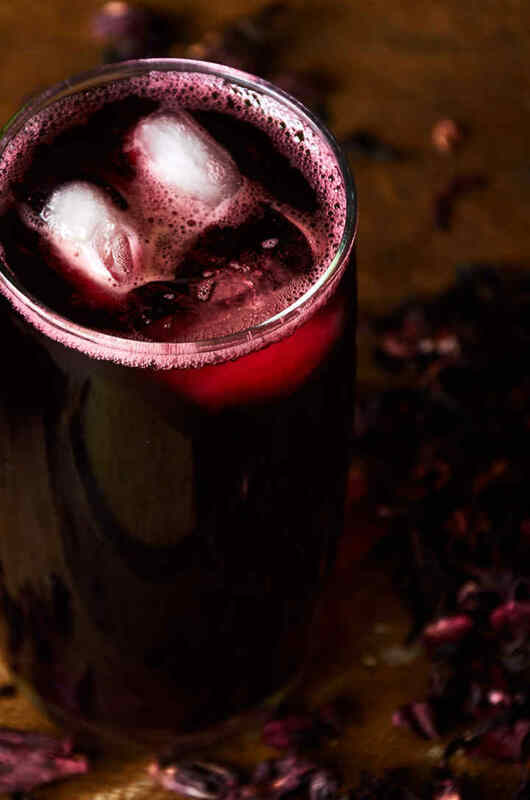 Mexico's well-known jamaica drink, Agua de Jamaica or "hibiscus water." A perfect drink to serve with the mid-day comida. The flavor is sweet and tart at the same time and very refreshing. The concentrate will keep for 3 days in the refrigerator. Store in a sealed container so that it doesn't take on flavors for other foods in the fridge. Are you able to reuse the flowers a couple of more times after the first batch is made? Most of the flavor is extracted in the first batch so any following batches will be pretty weak. You might want to give it a try though to see if there is enough flavor for you. Cheers! Can u use flowers again after one boiling? If you use the jamaica flowers again a second time they won’t have much flavor. You can give it a try to see if there is enough flavor for you. I’ll have to give this method a try. Sounds good! I was taught to make it using cold water and letting the flowers soak for a couple of hours. Does this affect the flavor? I was told that it is healthier if you don’t boil the flowers. This sounds exactly like the wonderful jamaica water I had in a local restaurant. If the concentrate only keeps three days in the fridge, can it be frozen? I don’t think I can drink it all up in 3 days. I was introduced to Jamaica tea in our favorite TexMex restaraunt. I would rather have it than a margarita! Our favorite waitress told me how to make it, and it is similar to this recipe. Then, one of my students got the flowers for me at one of our farmer’s markets. It was a gallon sized bag for about $6!!! I have it on the stove cooling down now. I am so excited to have this today!!!! My Abuela told me to boil the water, as soon as it’s boiling turn it off put the flowers into the water cover and immediately refrigerate. 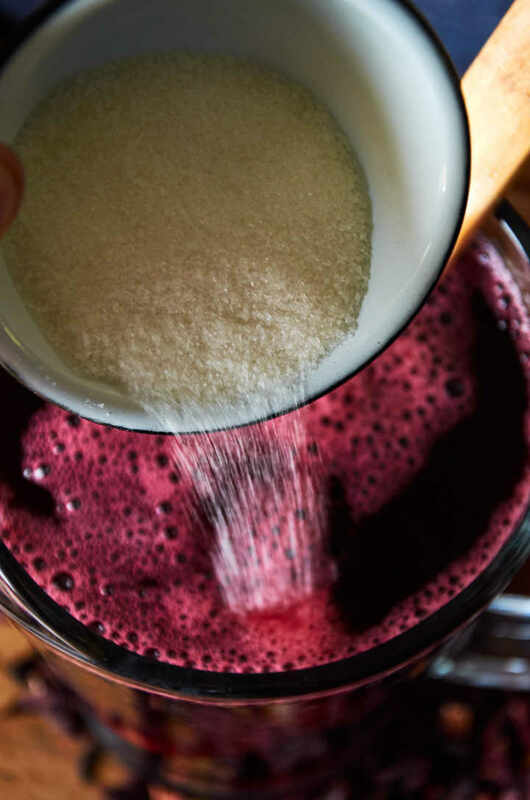 Also we don’t use sugar when making small batches for the family we just let everyone sweeten their own with the little agave syrup however when making a bigger batch for those who aren’t as familiar with the tart flavor sugar might be a good idea. 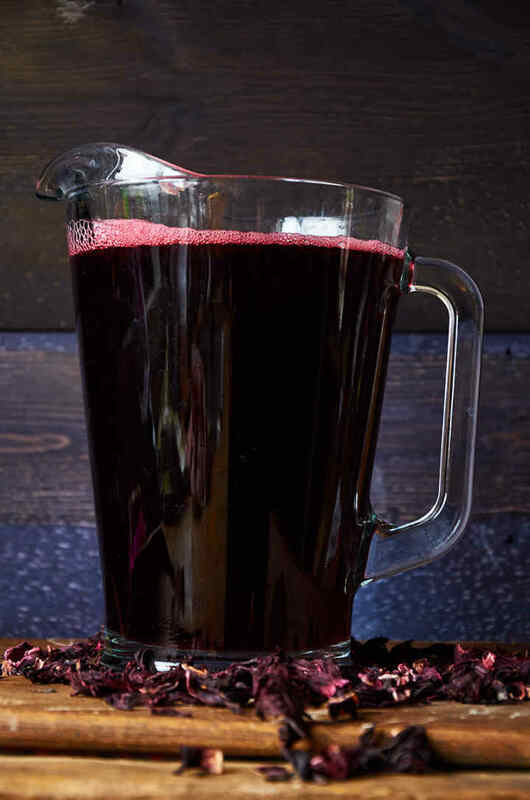 This is what Jamaicans call sorrel – a beverage that usually served at Christmas. We flavor it with ginger, spices and rum. So good! How come you didn’t add lime? Greetings, my name is Chidera Ugwu. My company is duly registered in Nigeria since 2017. 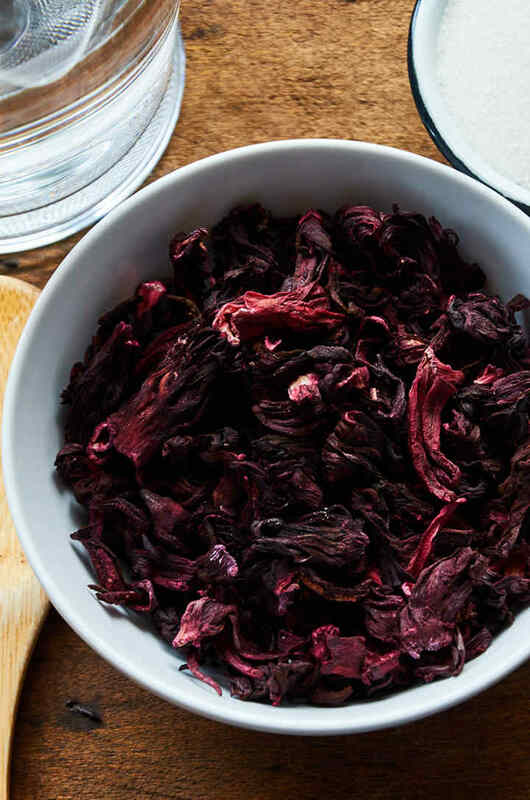 We supply high quality hibiscus, Ginger, turmeric, Garlic, pepper, spices, bitter kola, kola nut, honey etc for the production of the best herbal tea. We have clients across Europe,Asia, US and Africa. We can send you samples to examine if you are interested.